This area is comprised of 190 acres of conservation land. Two main trails lead to the pond. The Pond East Trail is blazed in yellow. The blue blazed path is called the Nancy Johnson Trail and leads you to the Pond West Trail meeting at the back side of the pond. All of the trails have rocks and exposed roots through out. Numerous wet areas are crossed by utilizing a variety of bridge types. Quite unique! There is also a portion of a former rail bed that runs by the parking area. You can go west for 0.75 miles before it ends. Heading east, it ends at Route I-93 in about 1.5 miles. Spring and summer have an abundance of insects! 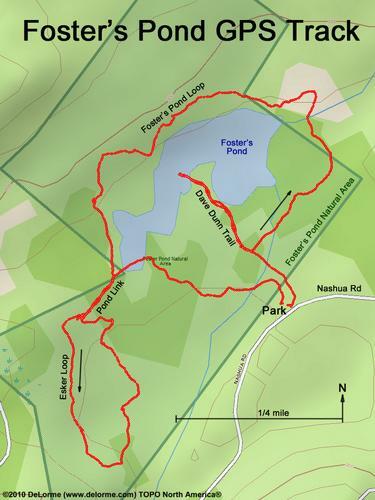 There are about 5 miles of enjoyable trails at Foster's Pond. Route 93 Exit 3. West on Route 111. At the second set of lights, turn right onto North Lowell Road. Go 1.2 miles and turn left onto Londonderry Road. Continue 1.2 miles and turn left onto Nashua Road. Go 0.4 miles and park in the second lot, near the basketball courts.